How long have we been counting things? An overview of library service performance assessment; Aligning the performance assessment process; A concise overview of current library service competition; Know things first: Identifying strategic information needs; ‘Knowns’ are really verbs: Using innovation to transform the ‘knowns’ into potential strategic responses; Improving potential strategic responses through access, accountability and alignment; Wash. Rinse. Repeat. Strategic responses are an on going process. A practice-driven and proven resource for library administrators of all types of libraries. The work describes how the library can identify the service environment factors impacting customers; strategic needs; identify library competitors; strategic abilities and service environment impacts; and use the combined results to develop proactive competitive responses that drive the service environment instead of reacting to the service environment. 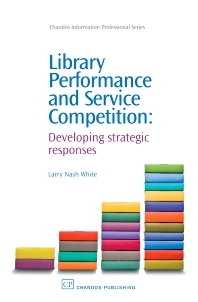 These strategic competitive responses would allow the library to increase the value of its service impact and effectiveness while increasing customer appreciation and the libraries advantage in the competitive service environment. Dr Larry Nash White is an Assistant Professor at East Carolina University Department of Library Science and Instructional Technology. Prior to that, Dr White worked as an administrator in retail management and public and academic libraries. He is an internationally invited speaker and presenter on library performance, leadership, assessment, and competition for service and consults with libraries and non-profit organizations. He has published in the area of performance assessment, competitive response, and financial management of libraries.